The heat is on and I can’t get too excited about slaving over a hot stove. 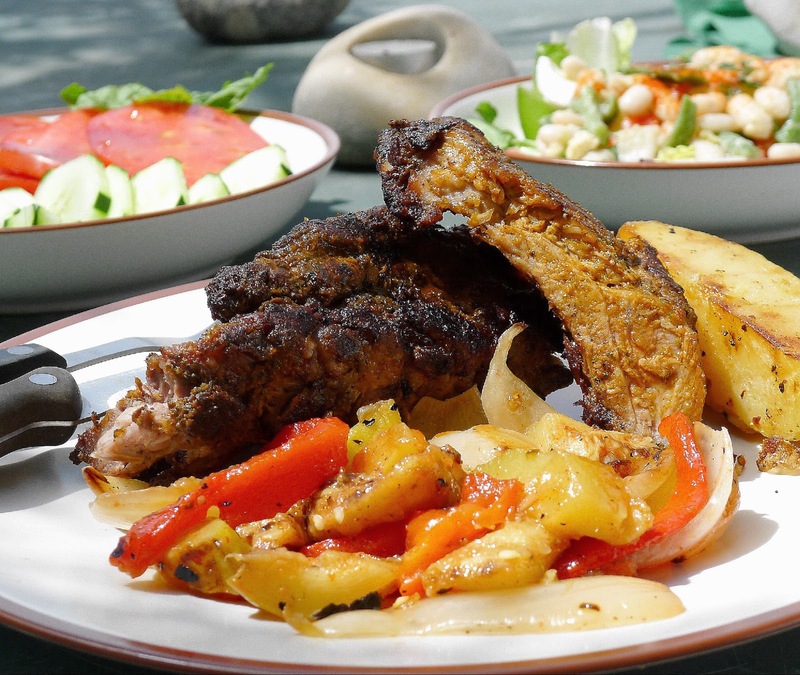 So I go for foods that cook in a flash, foods like boneless chicken breast, fish, shellfish, pork tenderloin, lamb chops or kebabs, ground meat, eggs, cooked ham. Fast foods--pan-grilled fish steaks, blender soup, quickie olive sauce. Potatoes and beans cook in the same pan. 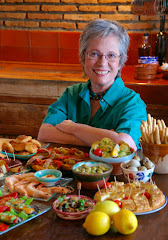 I add salads and quick-cooking vegetables, ready-to-serve starters and side dishes, fast and flashy sauces and, for dessert, either fresh fruit or store-bought ice cream, cake, pudding. 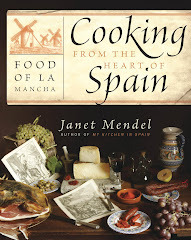 I couldn't cook without a blender and/or food processor, which make short work of smooth and cool summer soups; grated or sliced veggies for salads; fast-chopped ingredients for sauces. A microwave also saves time and, better yet, keeps a cool kitchen. Precooked foods save time at meal times. 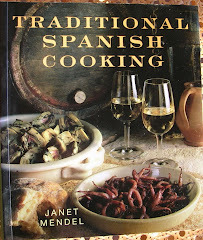 For example, in the summer, I like to keep on hand potatoes, boiled in their skins and well-chilled. These can become instant potato salad, Spanish potato tortilla, fast fries, or, be slathered with garlic and olive oil for grilling. 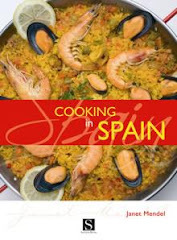 Cooked rice, macaroni, green beans, garbanzos and other legumes are equally useful, hot or cold. 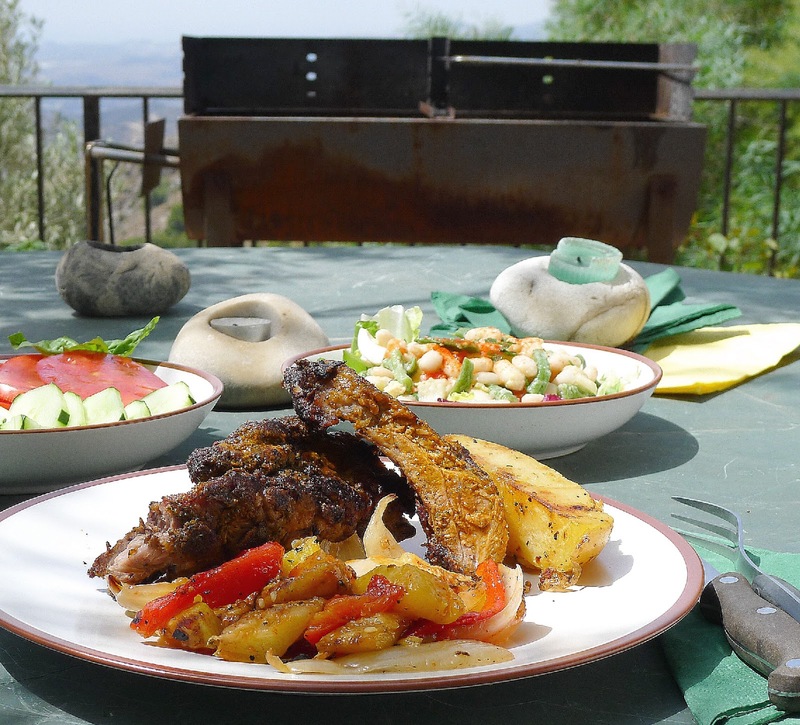 When you grill, take advantage of those dying coals to roast peppers, leeks and eggplant to be served, marinated, with the next day's meal. Summer meals needn't be served hot, hot. Cook the food and let it set until folks are ready to dine. Add sauces, garnishes and side dishes at the last minute. If food gets cold, don't sweat. 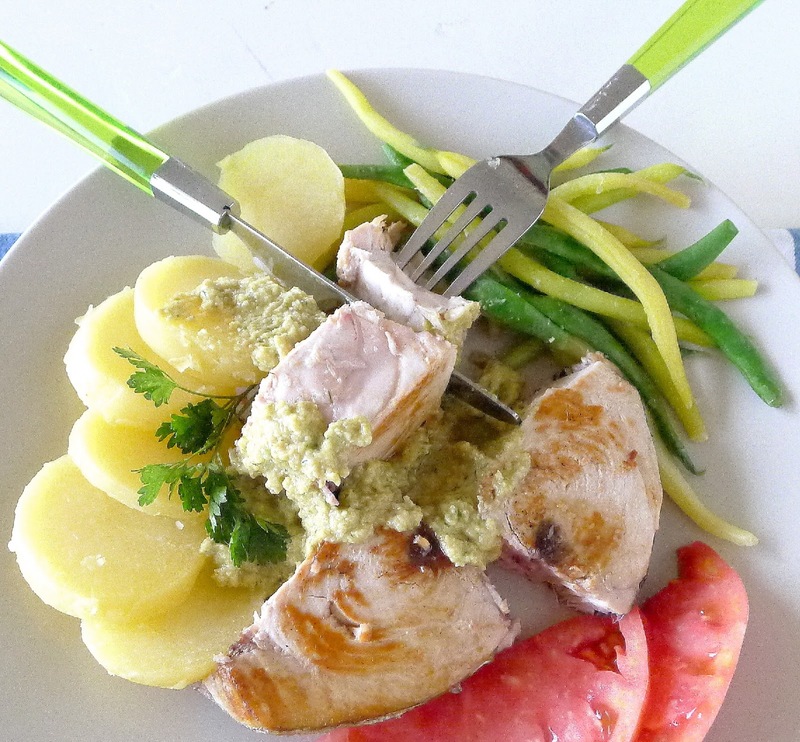 I put together three flash-in-the-pan meals, ready in 30 minutes. 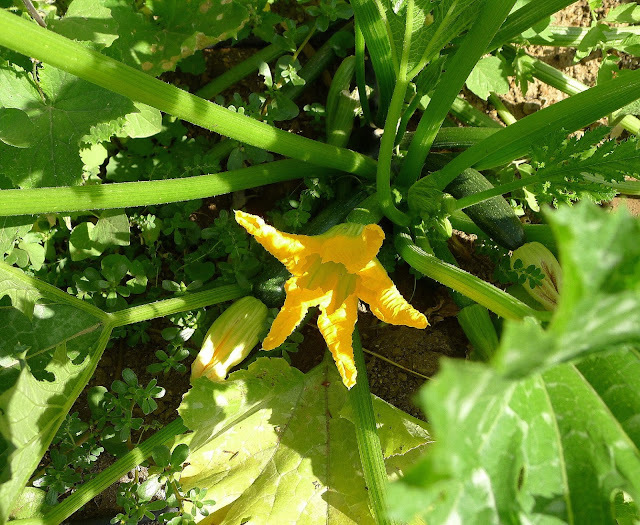 My menus are inspired by Mediterranean foods and, especially, by what’s in my garden right now—terrific tomatoes, zucchini, cucumbers and green and yellow beans. 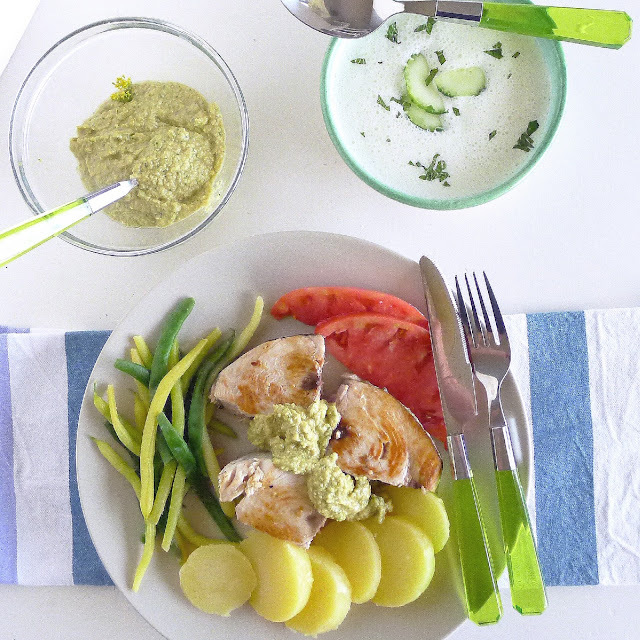 Menu #1: a starter of chilled cucumber soup, fish steaks with olivada sauce, potatoes, beans and garden tomatoes. 1. 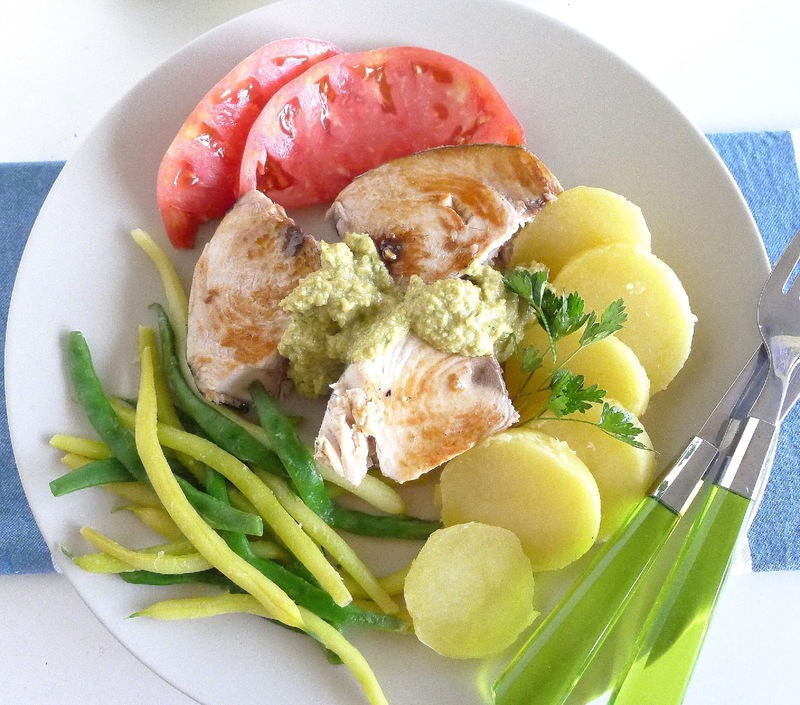 Chilled cucumber soup; grilled albacore steaks with olivada sauce; potatoes, beans and sliced garden tomatoes. 2. Tomato-cheese salad, pasta with shrimp and zucchini. 3. Watermelon salad, breaded chicken cutlets with red pepper mayonnaise, cous cous taboulleh, microwave zucchini. Ready, set, cook! Ingredients for a starter (cucumber-yogurt soup), main (pan-grilled albacore with olive sauce) and sides of beans and potatoes. All ready to serve in 30 minutes. Menu 1. 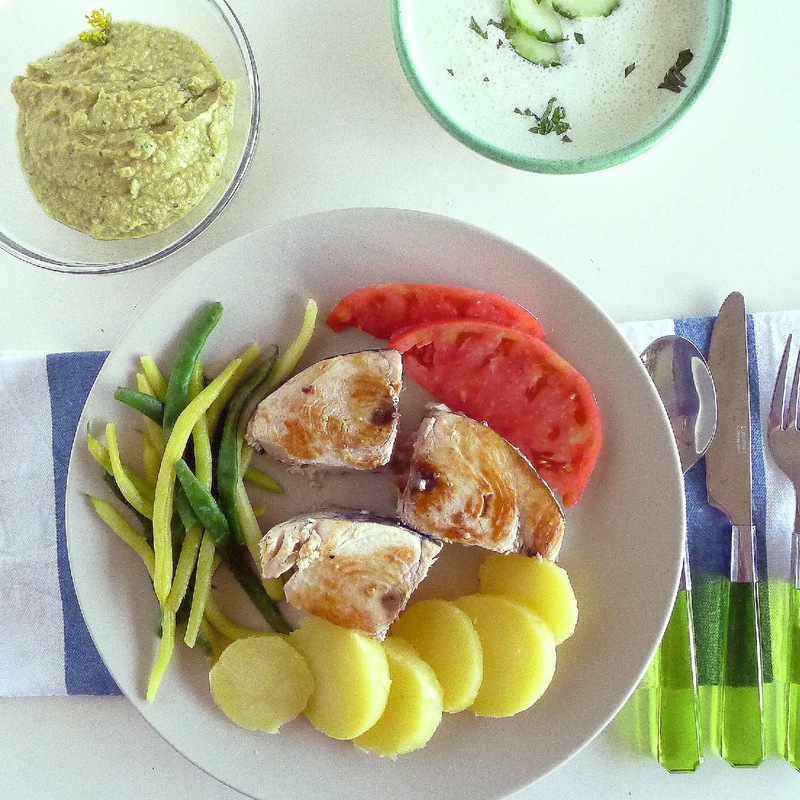 Cucumber soup, grilled albacore tuna with olive sauce, potatoes, beans and tomatoes. Bring a pan of water to a boil. (You can save a little time by starting with hot tap water and covering the pan. Add salt once the water boils.) Add 4 medium potatoes (one per person). Cook them, covered, until almost tender, about 18 minutes. Add ½ pound green beans to the pan and cook until they are crisp-tender, about 4 minutes. Drain the potatoes and beans and refresh with cold water. 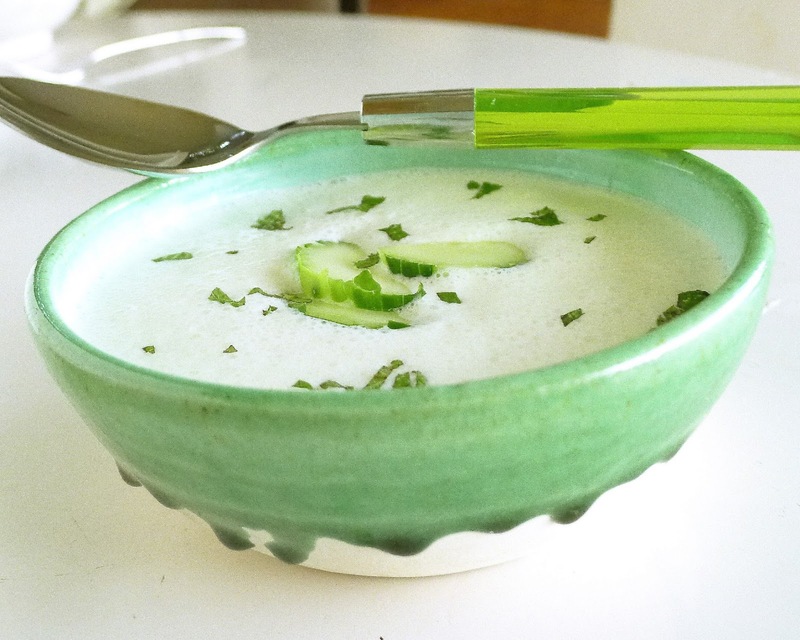 Once the potatoes are cooking, make the cucumber soup. Then start the albacore tuna steaks. While fish cooks, use blender to make the olive sauce. Serve the cucumber soup as a starter. Peel and slice the potatoes. Serve with the tuna, beans, sliced tomatoes and the olive sauce. Cool as a cucumber! Chilled soup is garnished with fresh mint. Cut the cucumber into chunks, saving a few slices for garnish, and place in blender or food processor with the yogurt, garlic, oil, ½ teaspoon salt, pepper, lemon juice and a few mint leaves. Process until smooth. Taste and add more salt, if desired. Stir in ice water. Serve garnished with thin slices of cucumber and chopped mint. Slather the olive sauce over tuna, potatoes and beans. 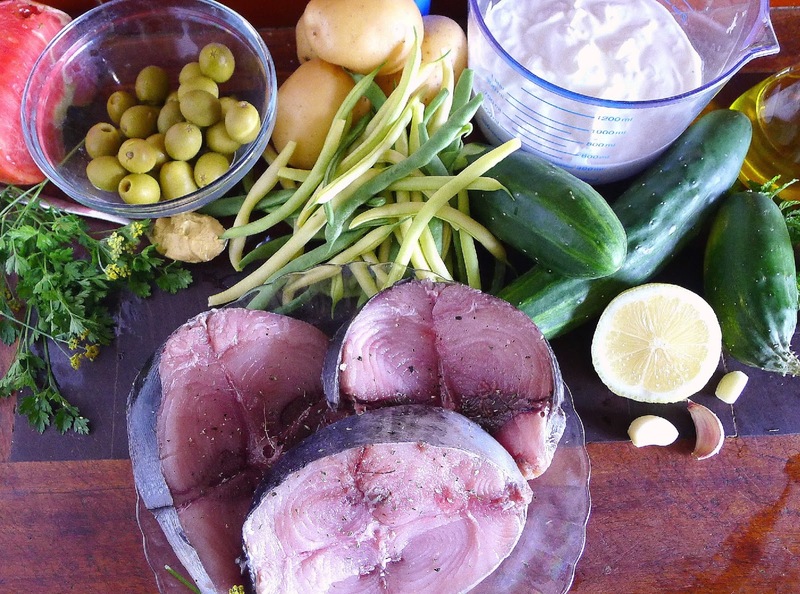 Have the albacore (bonito) steaks cut at least 1-inch thick. 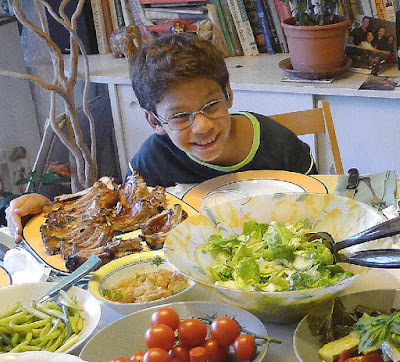 I used three good-sized steaks, weighing more than 2 pounds, because I wanted leftovers for making Niçoise salad for lunch the next day. Flash in the pan! Thick steaks of albacore tuna are cooked medium rare in the time it takes to brown them on both sides. Cook them whole and remove skin and bones to serve. 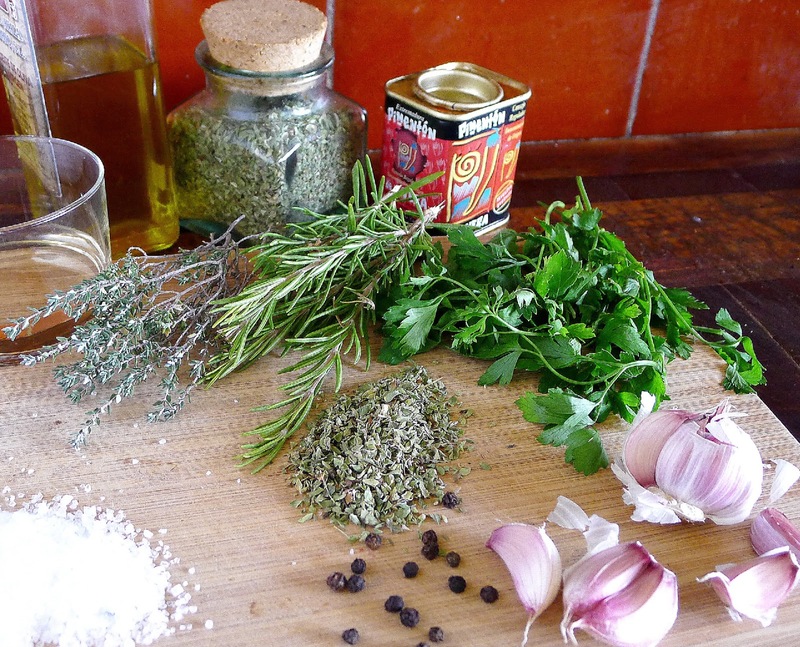 Sprinkle fish steaks with salt, pepper and thyme. Heat oil on high heat in a large, heavy skillet (such as cast iron). Add the steaks and cook until browned on the bottom, about 4 minutes. Turn and cook until medium-rare, about 4 minutes. 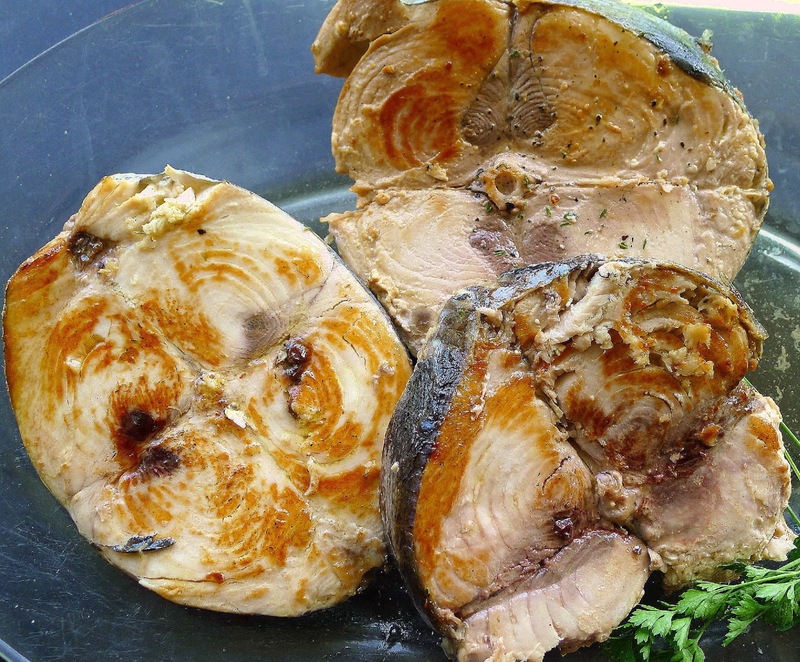 Cooked medium-rare, white albacore tuna stays moist. This sauce, which is somewhat like tapenade, is super quick to make. Slather it on the grilled fish, the potatoes, the beans. (Another version of olivada is here) Wild fennel is blooming near my garden patch, so I’m sprinkling some of the pollen on this sauce. (More about fennel pollen here ) This sauce needs no additional salt, as the brined olives with anchovy contribute the seasoning. 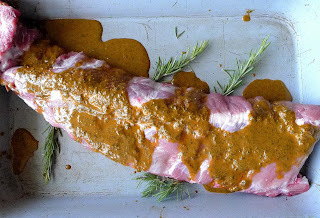 If you wish, thin the sauce with some of the drained olive brine. 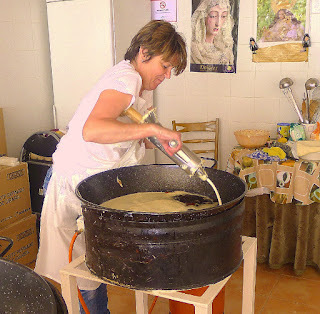 Put all the ingredients in a blender and process until fairly smooth. Keeps, refrigerated, for up to a week. Tune in next week for Menu #2. More of these to come from the garden! It’s the fragrance, the spicy-sweet perfume of ripe peaches, that attracts me to this luscious fruit. Eaten out of hand, the sticky juice dripping from my chin, the peach is my idea of heaven. 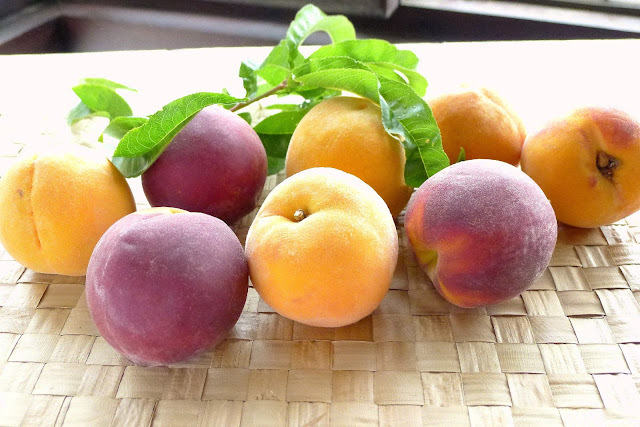 Yellow or red, peaches are a summer delight. I also serve cut-up peaches with raspberries and melon and a spritz of Sherry for a summer macedonia de frutas, a mixed fruit cup. 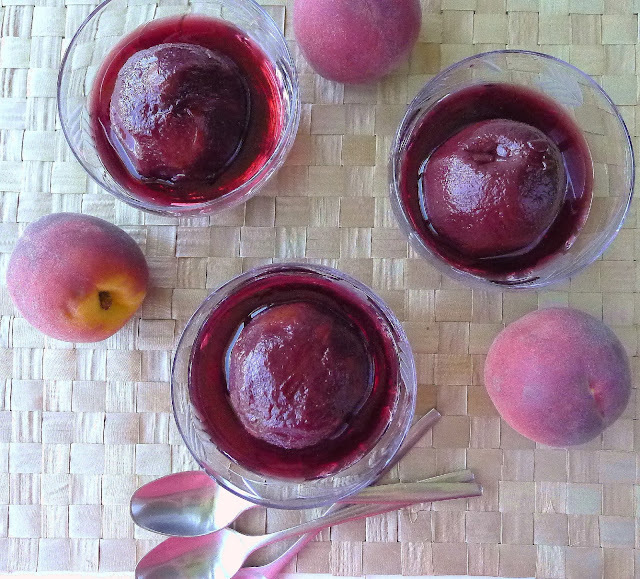 Peach puree is gorgeous for mousse (a recipe is here ) and for ice cream (recipe here). Peaches are an ideal fruit for pies and tarts. Peaches are either “freestone,” meaning the flesh easily pulls away from the pit, or “clingstone,” the flesh tightly adheres to the stone. 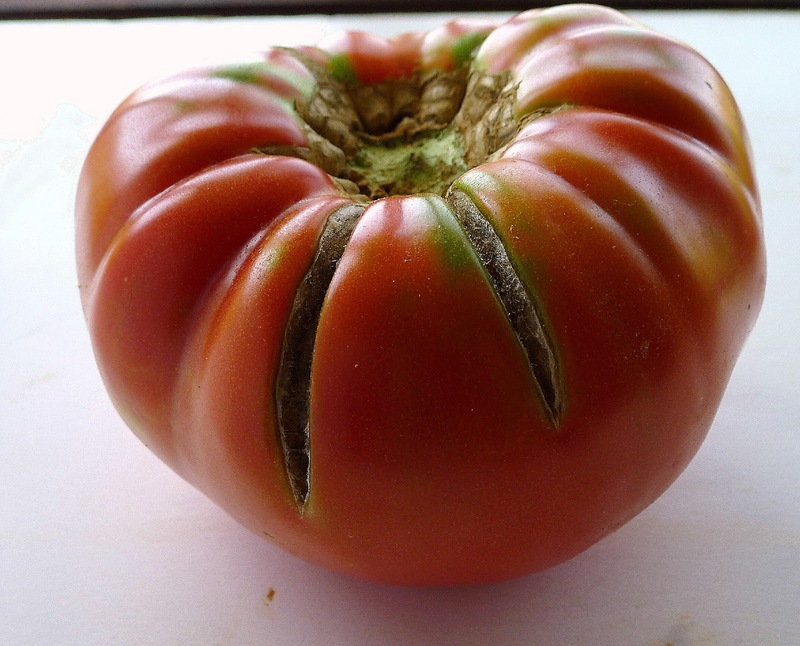 There are peachy-red varieties, yellow ones and pale, almost white-fleshed types. While I think of peaches as the zenith of summer fruits, in fact, many are late varieties that don’t mature until the end of September. Such is the famed yellow Calanda peach (Denominación de Origen Melocotón de Calanda) from Aragón in northeastern Spain). While still tiny, the fruit are enclosed in waxed paper bags that protect the peaches from bugs and the elements, allowing them to mature unblemished. They are especially sweet. Whole peaches poached in a red wine syrup. The Calanda peaches are marketed fresh and also canned. Famously, they are preserved in red wine syrup. 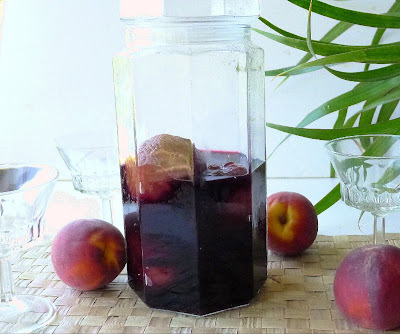 Red wine gives the peaches a jewel tone. These peaches are skinned, but not pitted. After poaching in the wine syrup, you can cut them up to serve or serve them whole with fork and knife and let guests slice the peaches at the table. Submerge the peaches in boiling water for 1 minute. Drain. When cool enough to handle, slip off their skins. 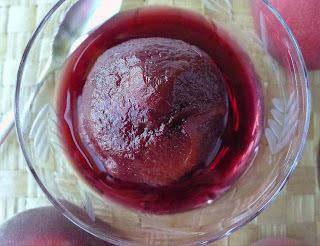 Cook peaches with wine, sugar, cinnamon stick. 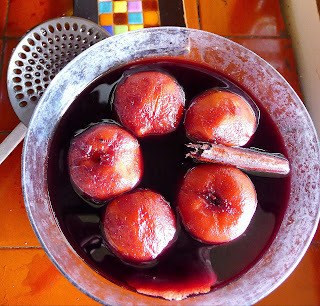 Place skinned peaches in a pan with sugar and enough wine to cover them. Add cinnamon stick and lemon zest. Bring to a boil, then reduce heat and simmer until peaches are tender when pierced with a skewer, about 15 minutes. Remove the peaches with a slotted spoon and place them in a heat-proof jar or bowl. Raise heat and reduce the wine syrup by half. Pour the syrup over the peaches. Cover the jar or bowl. When cool, place the peaches in the refrigerator. Serve the peaches, cold, with some of their syrup accompanied by a dollop of Greek yogurt, whipped cream or a scoop of ice cream. 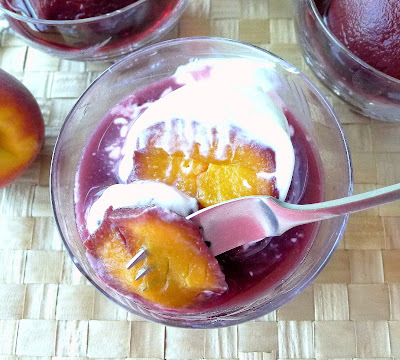 Serve the peaches with thick yogurt, cream or ice cream. After two weeks with a houseful of kids and grandkids, when I shopped for dozens of eggs, several loaves of bread and two or three melons at a time, here I am, home alone. I’m thinking, How long can I go without shopping again? 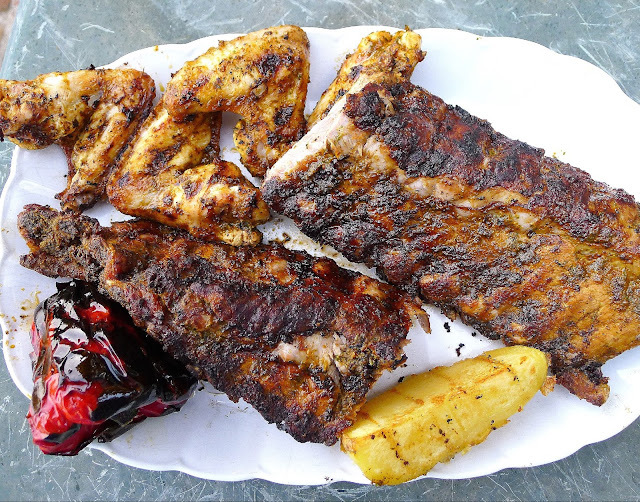 After a grand family grill fest (two racks of ribs, leg of lamb, two pounds of wings and a couple dozen shrimp), I don’t really want meat for a few days. So, with garden, freezer, fridge and pantry, I bet I can feed myself for a week without buying a thing. And, I think there’s enough vino rosado to see me through a few meals. Gazpacho makes a good accompaniment to a chard timbale. 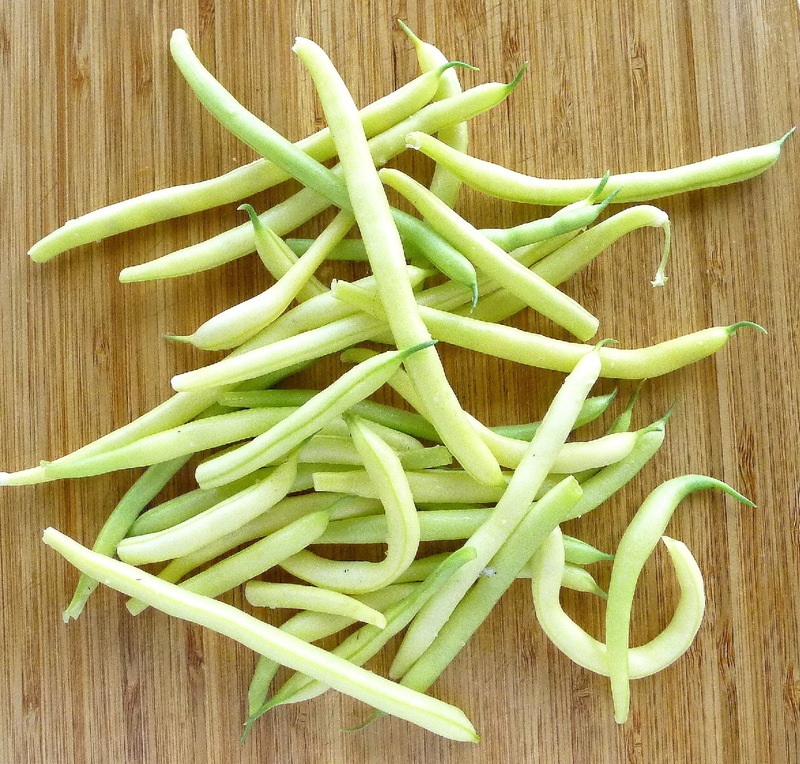 Fresh green or yellow beans, kidney beans, potatoes and onions for a one-dish salad meal. 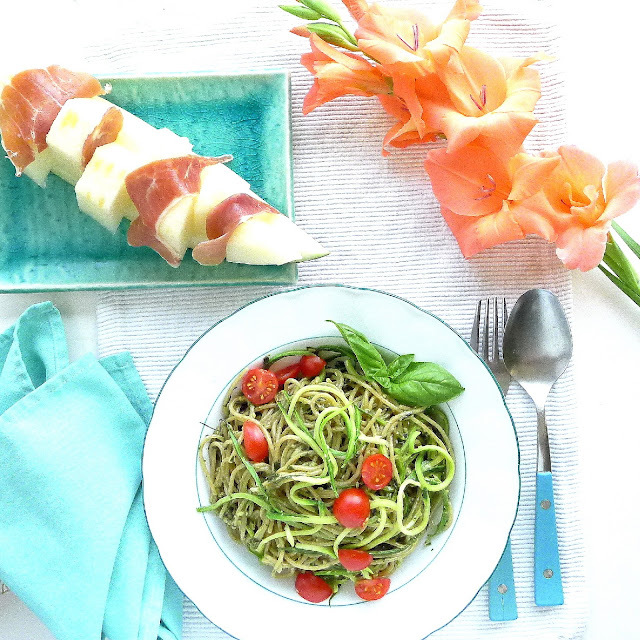 Spaghetti and zucchini noodles with basil pesto; ham and melon as a starter. Day 3. Spaghetti, Zucchini Noodles and Pesto. Ham and Melon. 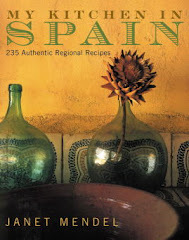 We finished off the really good hand-sliced Spanish ham, but I’ve got a package of sliced serrano. And the last of the melons. The perfect starter. 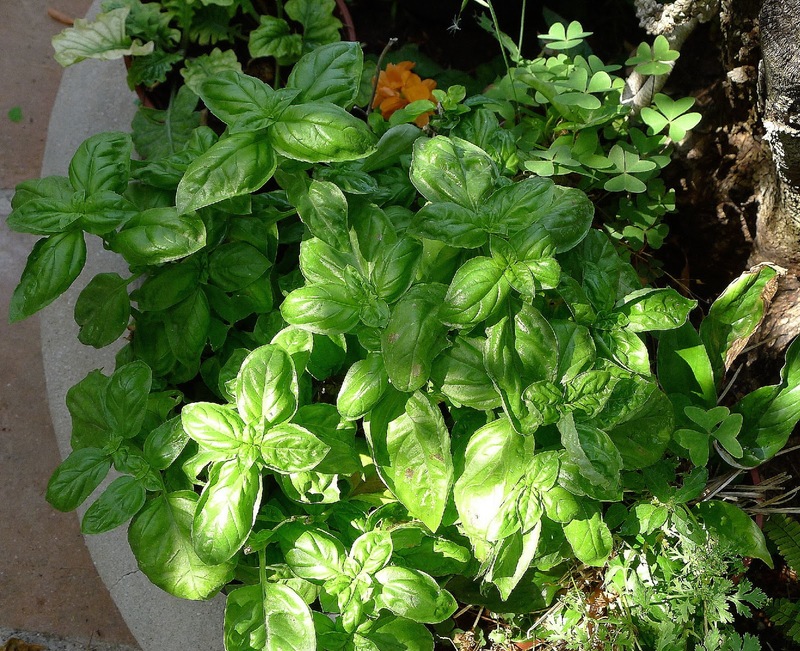 A pot of basil in need of cutting back calls for a pesto sauce, made with both pine nuts and walnuts. I stir it into a mix of whole-wheat spaghetti and “zoodles,” zucchini noodles made with a simple tool that looks like a vegetable peeler (it’s not an actual spiralizer), made with zucchini from the garden. 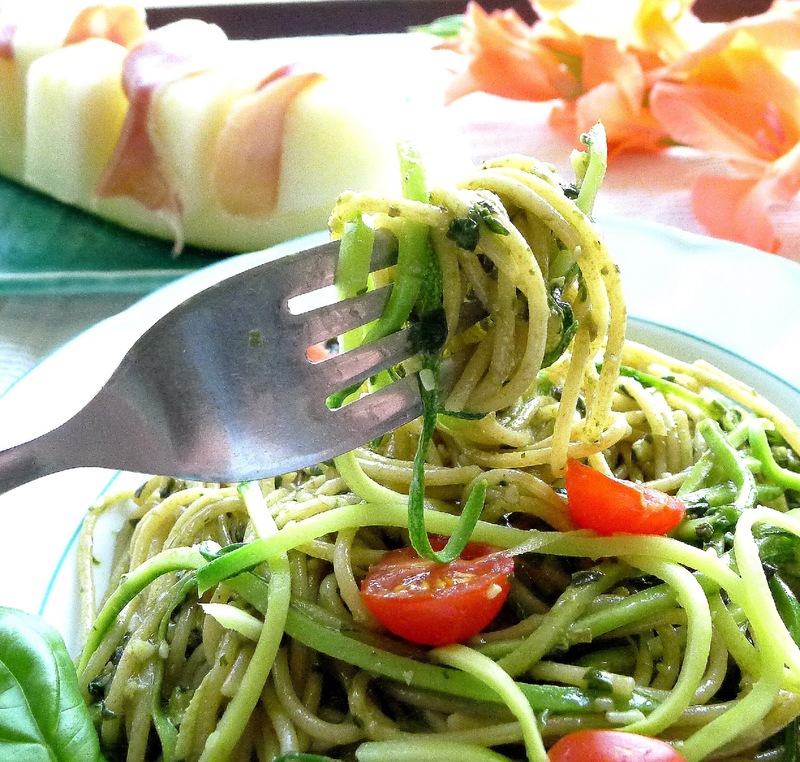 The zucchini noodles are microwaved for about 1 minute. Leftover pesto sauce will be great on beans too. Day 4. 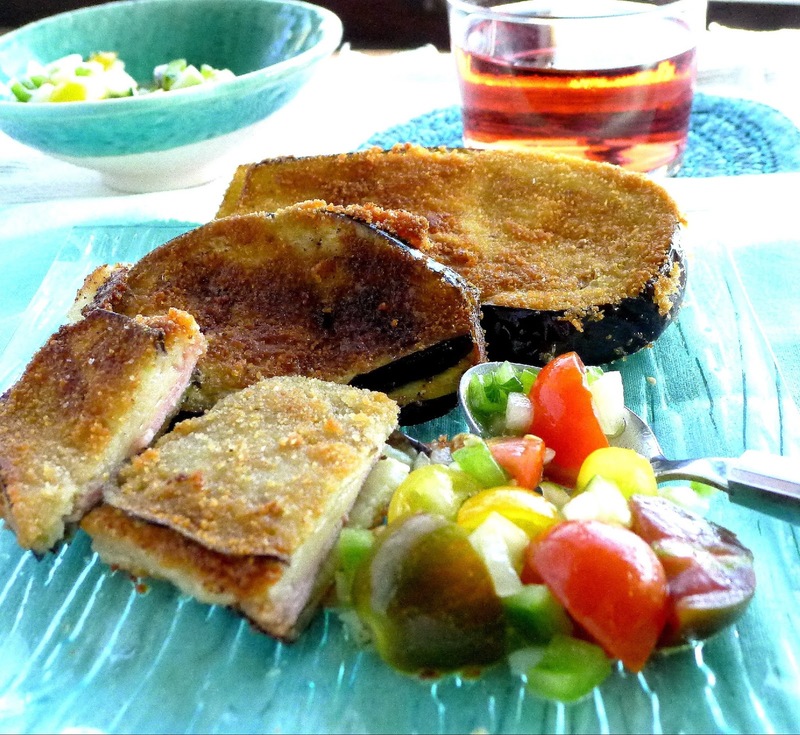 Crisp-Fried Eggplant and Cheese Stacks with Tomato-Cucumber Relish. I’m picking eggplant and cukes! 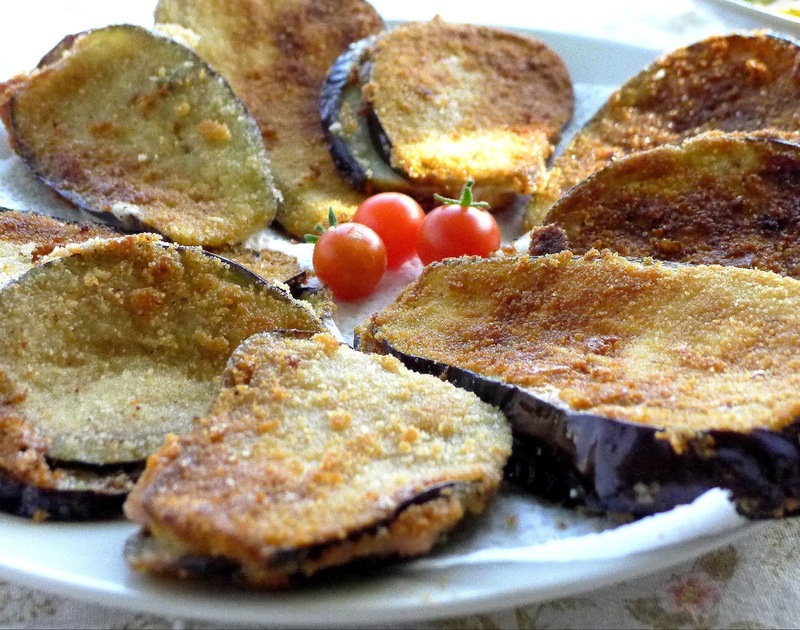 I slice the eggplant and sandwich it with slices of cheese and “lunchmeat” (ham would be better), then dip the stacks in beaten egg and breadcrumbs, frying in olive oil until crisp on the outside, molten on the inside. Eggplant sandwiched with cheese, fried crisp. 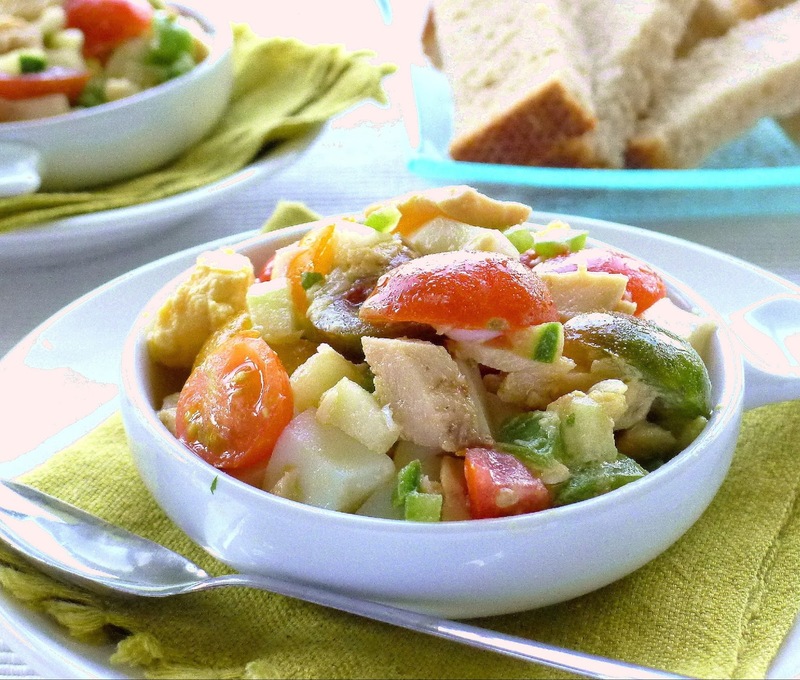 Piriñaca is a salad with tomatoes, peppers and cucumbers. Add tuna and chopped egg to serve as a tapa. 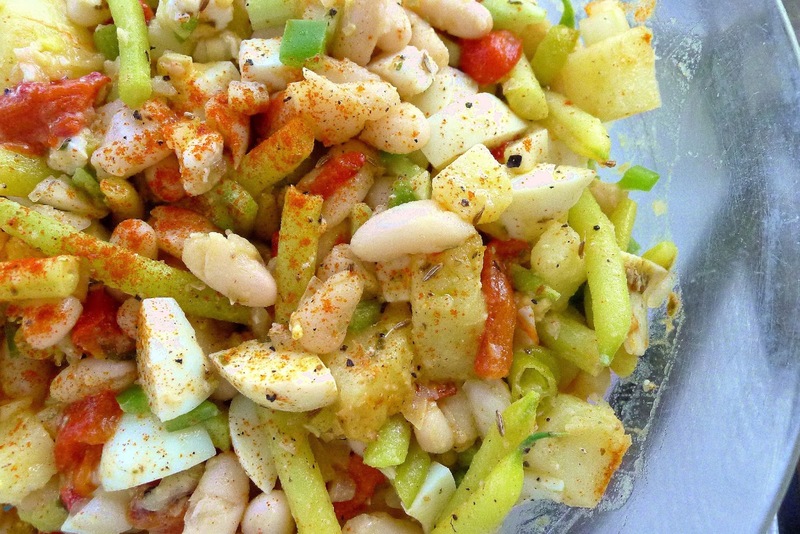 The recipe for the relish-salad, known as piriñaca is below. I think there are pickles in my future, if all those infant cucumbers grow up. 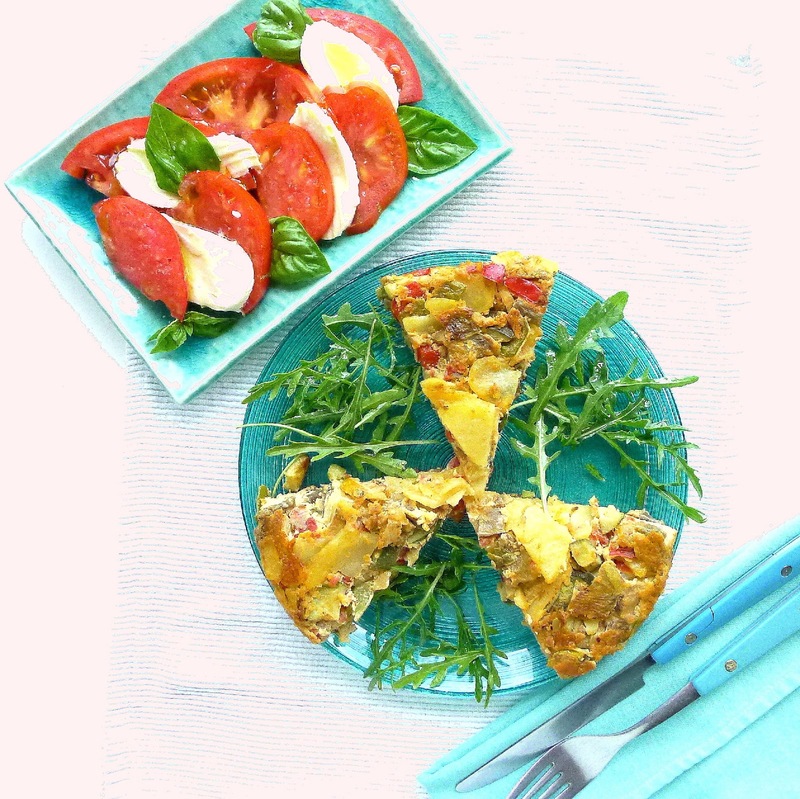 Slices of tortilla with eggplant, zucchini and potato; garden tomatoes with basil and mozzarella. Day 6. Before the week is done, it turns out I’m going to have to hit the hipermercado because I’m out of laundry detergent, toilet paper and bug spray. So, while I’m shopping, maybe I’ll buy some fish for dinner tonight. I’ve got several nice side dishes to go with it. The potatoes and beans can be cooked in advance. Potatoes are easier to dice if they are chilled. A good addition to the salad—liquid from capers, pickles or preserved lemons. Serves 2-3 as a main dish or 6 as a side. Cook the whole potatoes in boiling, salted water to cover. When they are nearly tender (about 12 minutes), add the beans. Cook until beans are crisp-tender, 5 minutes. Drain and refresh with cold water. When potatoes are cool enough to handle, peel and dice them. 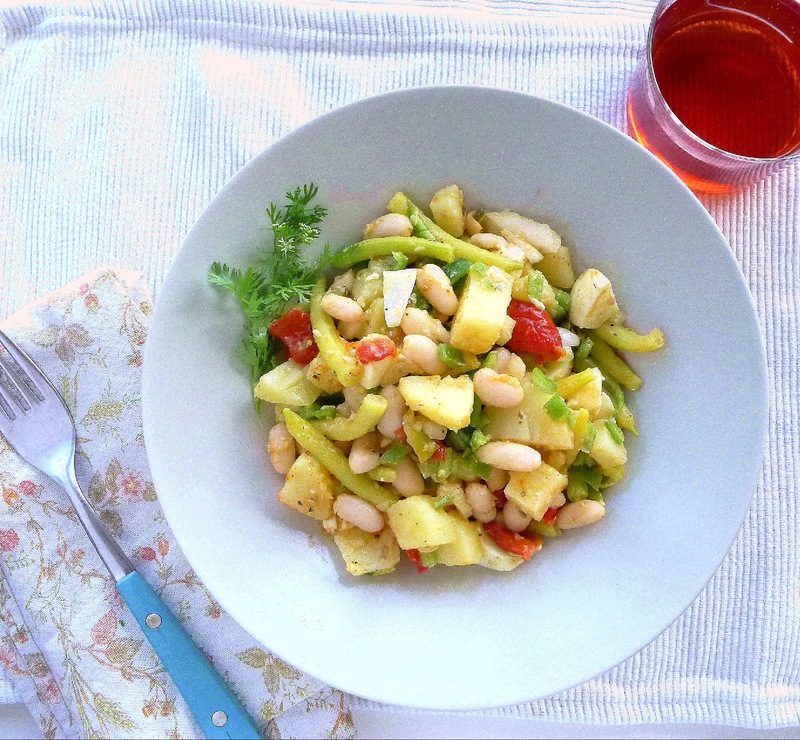 Place in a salad bowl with the beans. Add the roasted red pepper, celery, onion, guindilla, green pepper and garlic. Combine thoroughly. Add the chopped eggs, oregano, cumin, cumin seed, kidney beans, queso fresco, salt, pimentón, olive oil and vinegar. Use a large spoon to gently combine all the ingredients. Cover and refrigerate at least 1 hour before serving. Garnish with chopped cilantro. 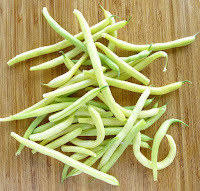 Mix two or three beans, crunchy celery, olive oil and vinegar. Add cheese if you like for a main dish. 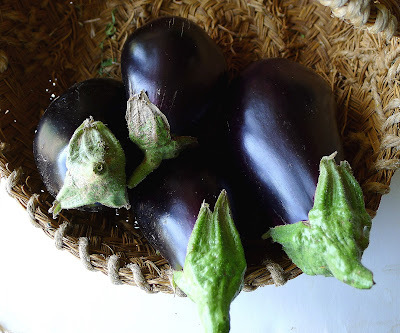 Tomato-cucumber salad makes a nice side with fried eggplant "sandwiches." This is a typical salad in Cádiz. 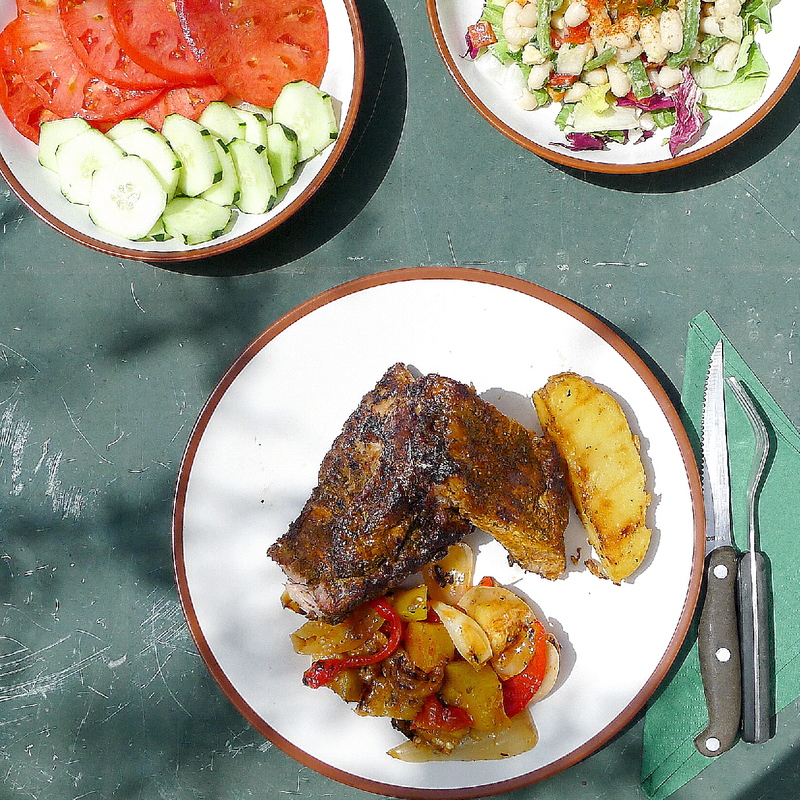 Another version, minus the cucumber is known as pipirrana (see that recipe here ). 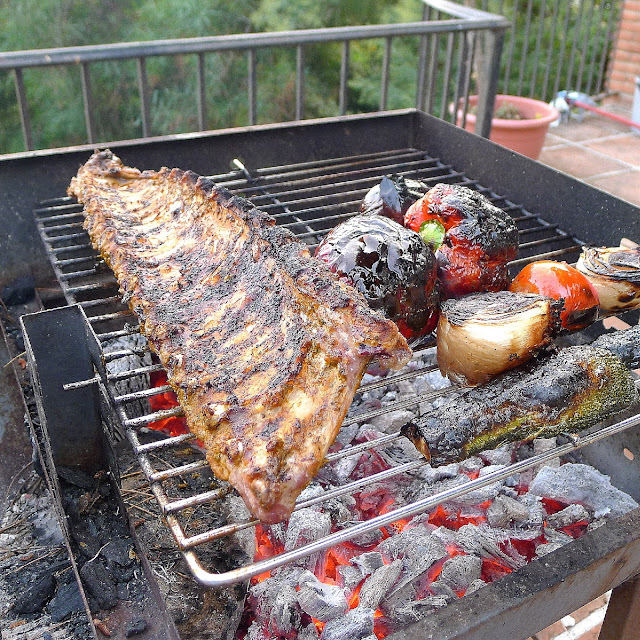 Piriñaca is the perfect accompaniment to grilled sardines or mackerel or to any fried fish. As a tapa, the salad usually includes chunks of canned tuna and hard-cooked egg. My version is fairly traditional, but I’ve used quartered cherry tomatoes in two or three colors in place of the chopped tomato and I’ve added a chopped (mild) fresh jalapeño, just for fun. Allow the salad/relish to stand at least 30 minutes or, refrigerated, up to 24 hours. The salt draws out the juices from the tomatoes. Serve the salad with bread for soaking up the juices. Combine the peppers, cucumbers, onions, tomatoes and parsley. Add the olive oil and vinegar and about 1 teaspoon salt. Allow to stand 30 minutes before serving. Garnish with chopped egg and tuna, if desired. You could add chopped chorizo to this tortilla. 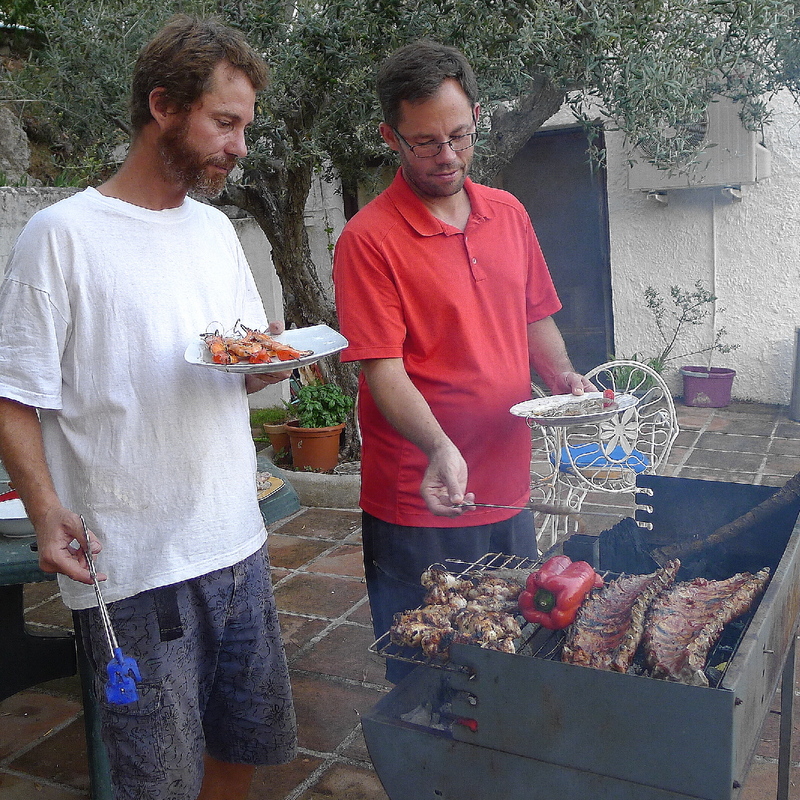 Or, stir in some smoked pimentón (paprika) to give it that flavor without the meat. Heat the oil in a medium skillet. Add the potatoes and cook, stirring occasionally, until they are tender, about 10 minutes. Do not let the potatoes brown. Carefully strain the potatoes through a heatproof sieve, reserving the oil in a heatproof bowl. Set the potatoes aside. Return 1 tablespoon of oil to the skillet. Add the eggplant, peppers, onion and garlic. Sauté on medium heat 5 minutes. Add the zucchini and cook 5 minutes more. Add the tomatoes and salt. Cook until tomatoes are somewhat reduced, 10 minutes. 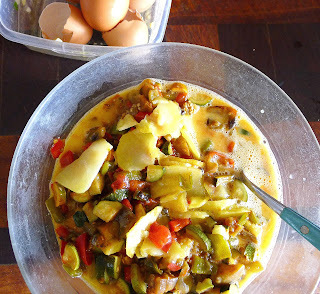 Mix potatoes and vegetable mixture into the beaten eggs. Beat the eggs in a large bowl with 1/2 teaspoon salt. Stir in the potatoes, then the pisto (eggplant, zucchini, tomato mixture). If necessary, wipe out the skillet. Add 2 tablespoons of the reserved oil. 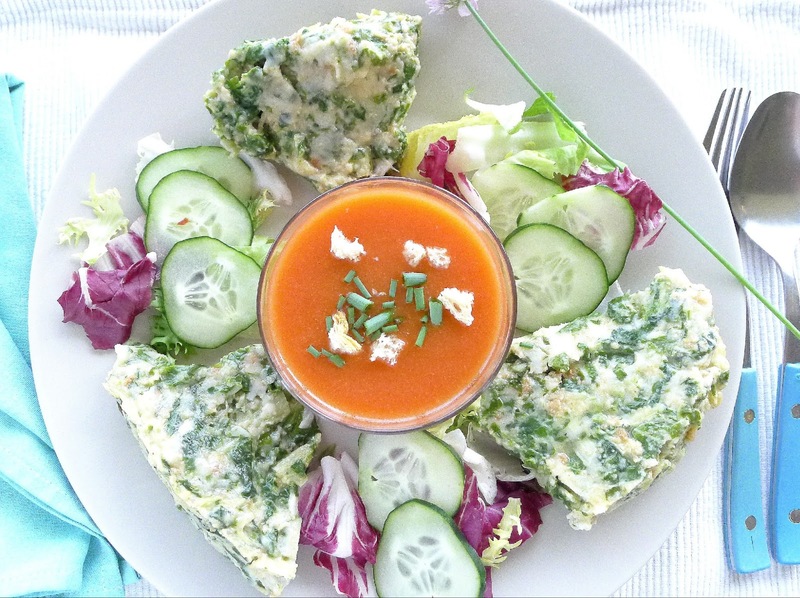 Pour in the egg-vegetable mixture. Cook on a medium heat, allowing the mixture to set on the bottom without browning. Use a spatula or wooden paddle to firm the sides all around. 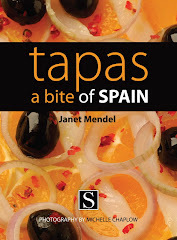 When tortilla is nearly set—6 minutes or so—place a flat plate or pan lid on top of the skillet. Working over a bowl to catch any drips, carefully invert the skillet so the tortilla is turned out onto the plate. Add 1 tablespoon of reserved oil to the skillet and very carefully ease the tortilla back into the pan to cook on the reverse side, 3 minutes. Slide the tortilla onto a serving plate. On Sunday morning, it’s off to the pueblo for churros! Churros are fritters of fried dough, the original doughnut, if you like. 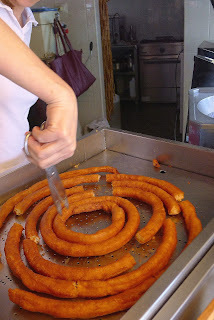 At some city markets you find churro vendors every day, but in my village, it’s a Sunday morning custom. 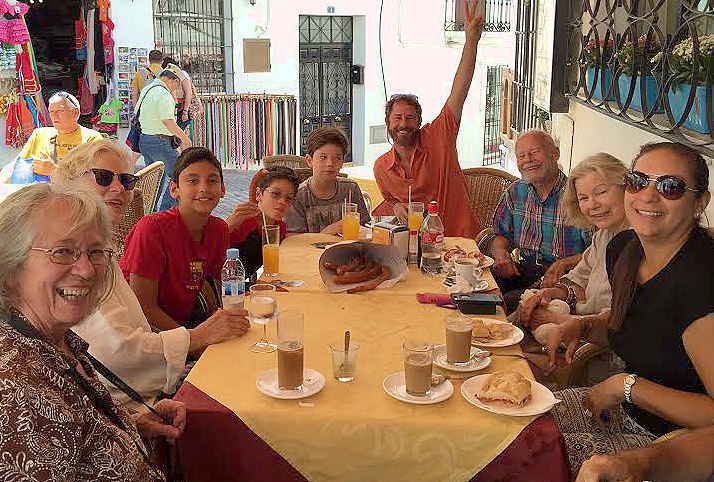 I’ve got family visiting from the U.S., so we are a big gang, requiring two tables pushed together at the Bar Porras, right in the central plaza. Some of us go for churros, another gets the Sunday papers (Diario Sur, the Málaga daily, and El País published in Madrid). Sunday morning churros gang. Thanks to the waiter for the photo--he managed to leave Daniel out. That's me on the left. Ben with his arm raised. 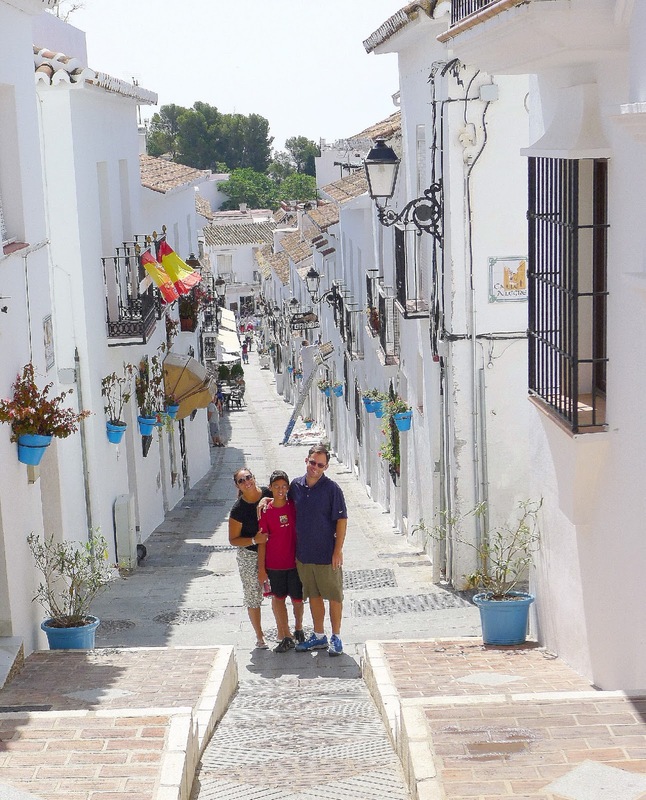 Yep, those are tourist shops in the background. Calle San Sebastian funnels us right into the main plaza and the breakfast café. That's Daniel, Eli and their older son, Lucas. 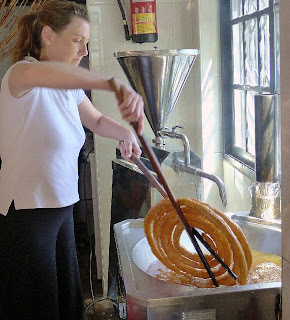 Churros, but only on Sundays. 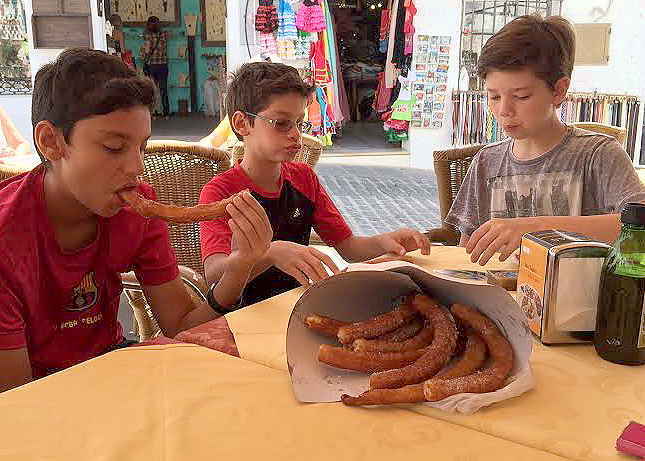 Tio Ben takes his nephews to buy churros. Only on Sundays! We have to wait while the oil comes up to temperature. This churro vendor uses a machine to extrude the batter into hot oil. 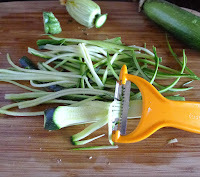 --and scissors to cut it into short lengths. Lastly, the churros are liberally sprinkled with sugar. 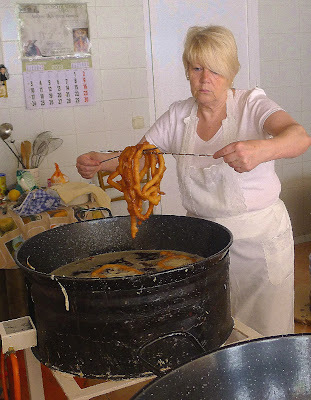 Here's another churro maker in the village. She uses an old-fashioned extruder, braced against her arm, to push the stiff batter into rings in the hot oil. These fried rings are strung onto stems of rush (juncos). 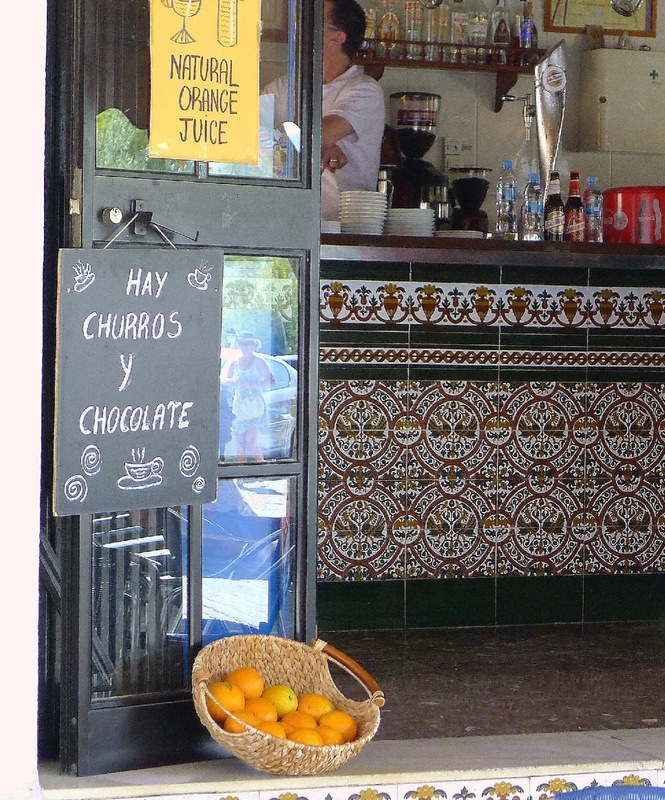 We order café con leche, freshly squeezed orange juice, pitufo Catalán (toasted roll with grated tomato, extra virgin olive oil and serrano ham) to accompany the churros. 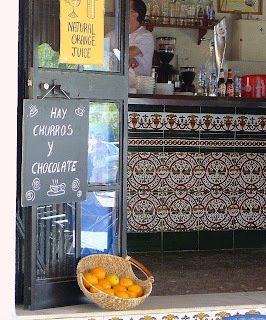 Chocolate—a thick hot chocolate—is a favorite with churros, but seems too heavy for a sunny summer day. Churro vendors use less expensive sunflower oil for frying, but home cooks might use real olive oil. 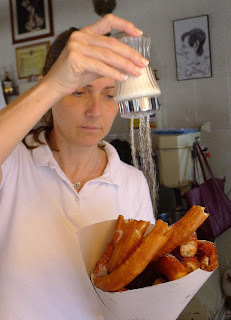 While there is no sugar in the batter, it’s customary to sprinkle the churros liberally with sugar. 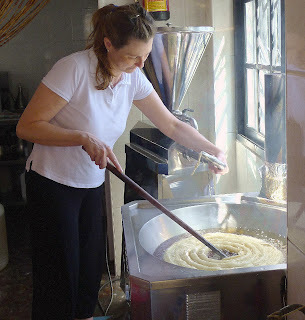 I don’t make churros at home. Half of the pleasure of eating them is the social occasion, sitting in a café and watching people come and go, checking in with friends passing through the plaza (last Sunday, villagers were off to the polling stations for national elections), catching up with old acquaintances, complimenting each other on how guapo/a is their little boy/girl. 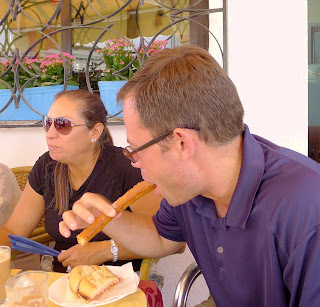 Here's Daniel and his wife Eli, who live in Atlanta, GA, enjoying churros. They've already greeted about six old friends. 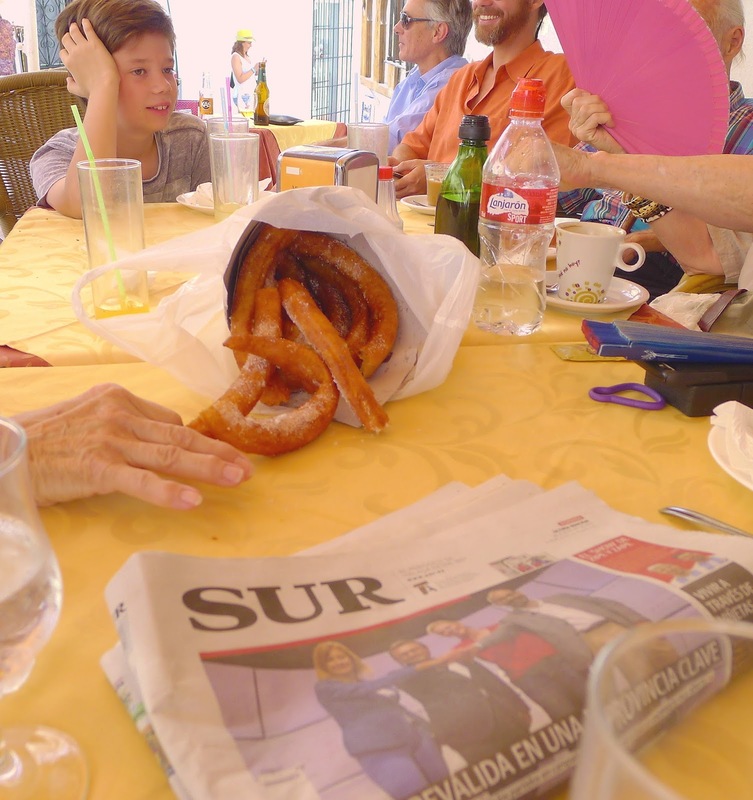 Sunday papers are part of the churros experience. 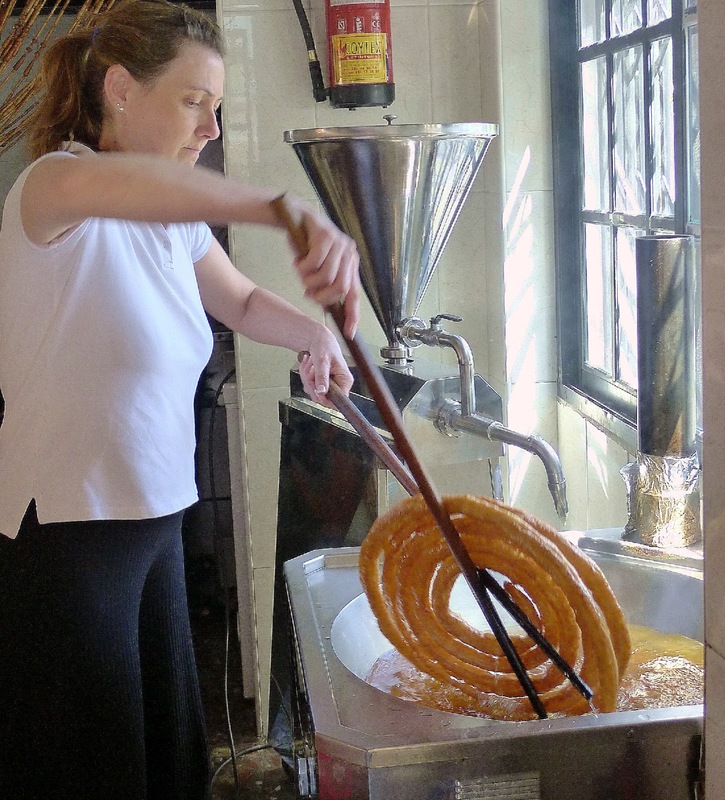 You can watch a home cook make churros here (in Spanish).